Round 1: No touch of gloves to open the fight–not surprising. Curz opens with his typical amazing footwork and movement. Faber shoots for a double leg, but literally no one is there. Faber with a body lock, looking to whip Cruz to the ground, but Cruz defends in amazing fashion. Possible big trouble for Faber. Body kick from Cruz coming off a combo. Cruz popping his jab and moving side to side as Faber looks perplexed. Faber sends a straight right down the pipe that floors Cruz, but Cruz manages to snap right back to his feet. Amazing. Cruz catches a Faber kick and counters with a straight punch of his own. Big uppercut from Cruz tags Faber and the crowd reacts accordingly. Cruz switching from southpaw and regular. Left hook by Cruz lands. Leg kick by Cruz snaps the lead leg of Faber. 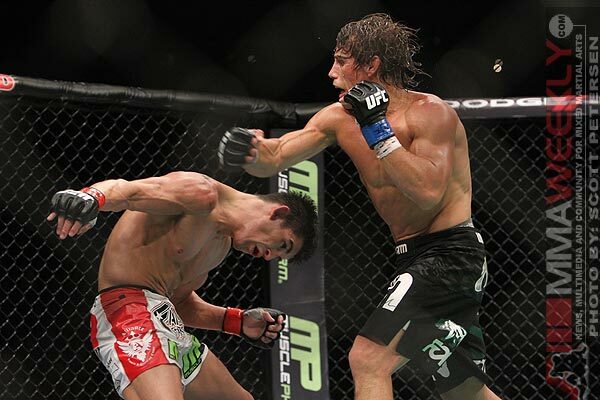 Faber pressures Cruz against the cage and secures him against the cage, looking to drag him to the canvas. Faber with a thai clinch and lands a few knees. The round ends with a brief takedown by Cruz. MMAWeekly.com scores round one 10-9 for Cruz. Round 2: Faber opens trying to grab ahold of Cruz, but Cruz is gone before Urijah gets there. Nice straight left jab from Faber as he backs Cruz up for a moment. Left hook followed by a brutal straight right from Cruz, possibly the best strikes of the fight for him. Nice counter right hook from Faber as Cruz left himself open. Faber misses with a wild hook and resets. Right hook by Cruz connects as Faber was backing away. Great storyline developing in this fight–pure beauty. Leg kick/head kick combo from Cruz lands as the crowd erupts. Leg kick from Faber stings Cruz. Straight right from Faber drops Cruz and Faber rushes in. However, just like the last punch, Cruz is back to his feet before I finish the sentence. Cruz with a huge takedown, as he slams Faber to the canvas, and looks to finish the round. Faber escapes and is back to his feet. Left hook/right hook combo tags Faber as the round ends. MMAWeekly.com scores round two 10-9 for Cruz. Round 3: Faber opens with a front kick to try and establish some rhythm and keep Cruz at bay. 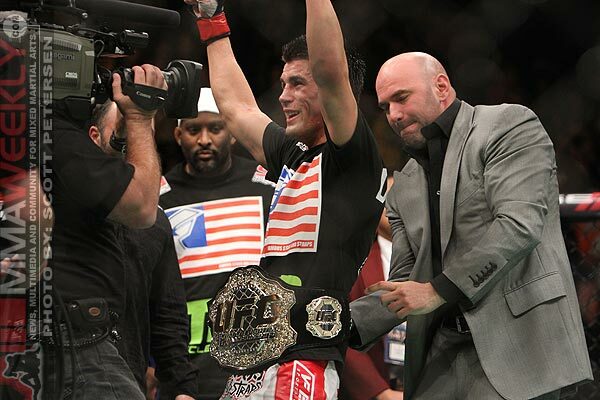 I think we all know there is no stopping the movement of Dominick Cruz, however, and Cruz keeps on coming. Leg kick from Cruz, followed by a jumping kick to the body that lands from Cruz. Cruz snaps his jab out looking to disrupt the movement of Faber. I don’t’ know if I’ve ever seen two fasters athletes in the Octagon at one time, a pure treat. Huge lead right from Cruz snaps Faber’s head back with authority as the crowd reacts with a cheer. Body/body/leg kick combo from Cruz as he hasn’t slowed down a bit. Faber briefly takes Cruz’ back, but Cruz switches and lands himself in side control. Another straight right from Cruz has Faber backing up. Leg kick from Cruz, followed by a high kick, and this is beginning to look like a classic Cruz performance. Cruz feigning and switching levels to give Faber different looks. Cruz pops Faber with a jab and clinches with Urijah as the round ends. MMAWeekly.com scores round three 10-9 for Cruz. Round 4: Right hook/right hook/body kick combo from Cruz opens round 4, and he doesn’t seem to be slowing down, even a little. Right to the body from Cruz. Straight right from Faber drops Cruz once again, but he’s right back to his feet, like in rounds 1 and 2. Faber shoots for a double leg, but Cruz once again easily shrugs him off. Faber seemingly finding a bit of rhythm this round. Knee to the body from Cruz stifles Faber’s pressure for the time being. Cruz popping the jab, and follows with a takedown attempt that fails. 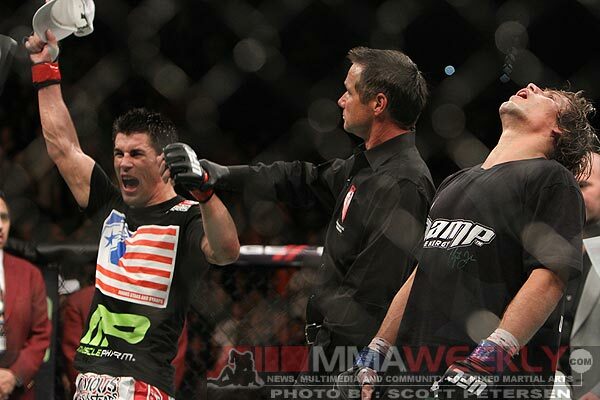 Faber looking for his trademark lead uppercut, but Cruz is all over it. Brief clinch that sees Cruz land a hook. Left to the body, straight right from Faber connects. Right hook from Cruz clips Faber on the chin and they separate to find their range again. Cruz shoots a single leg but Faber shrugs him off with ease. The horn sounds on the round with the fighters clinched. Close round. MMAWeekly.com scores round four 10-9 for Faber. Round 5: Cruz opens with a knee to the forehead and backs Faber up, and he’s wobbled. Faber swinging wildly now looking to pressure, and he may possibly still be hurt. Cruz now with a body lock and swings Faber to the canvas, but Faber gets up immediately. The fighters now clinch against the cage as time ticks away. The fighters separate and the crowd cheers. Faber tries for a flying knee and it grazes Cruz’s body, but he recovers. A brief scramble ensues but we are back to standing. The crowd erupts with, “Faber, Faber, Faber!” chants. Cruz takes a deep breath, resets, and looks to begin striking again. Cruz with a trip takedown on Faber, and Faber immediately scrambles to his feet as they now clinch against the cage. Two minutes left in the final round. Both fighters switching stances now, and getting a bit fancy. Faber connects with a left hook, followed by a front kick. The crowd begins to erupt as we close in on one minute. Cruz is tossing Faber around with various takedowns, but Faber keeps getting up. Cruz shoots for a final takedown as the round ends. MMAWeekly.com scores round 5 10-9 for Cruz.